IPAM for iTop is the module / extension version of TeemIp that can be integrated on an existing iTop instance. It only provides the core IP management features embbeded in TeemIp standalone. 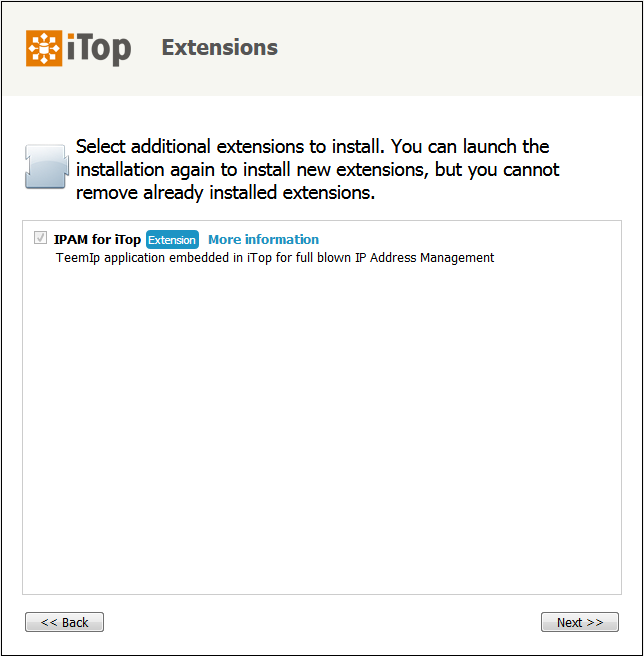 Other features are available for iTop through extensions. This IPAM for iTop extension is available through iTop Hub and can be automatically downloaded and deployed from there. If IPAM for iTop does not appear in the list of extensions (or if the whole extensions step is skipped during the setup), make sure that the web server process has enough rights to read the extensions directory.